Need a perfect solution to help children get their energy or wiggles out? These are my tried and true best movement and action songs for children! Do you need the perfect song to keep the children entertained for circle time? Or perhaps you have a toddler or preschooler who just needs something to cure a grumpy day. 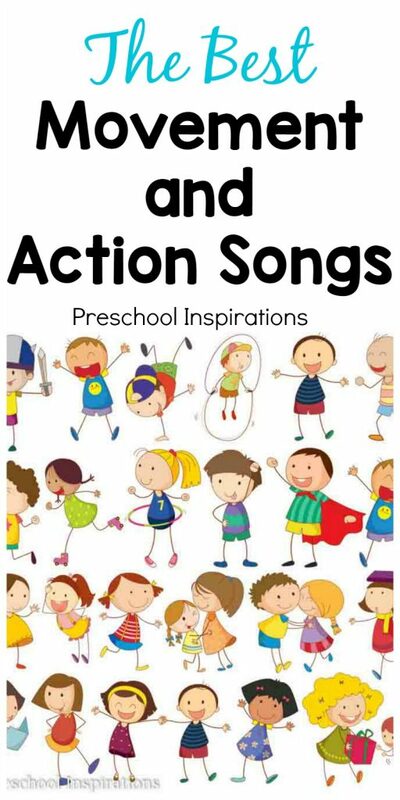 I have used many of these songs for circle time, for transitions, for family dance nights, for bad weather days, and for those moments in your preschool curriculum where we need to do something to keep us busy and moving! Here are my favorite movement and action songs. Learning these songs is one of the best things I ever did! This song is one of the absolute best! Anytime we do it for the first time in a long time, I can feeeel it! P.S. I did this song for a year or two without realizing the awesome motions! Did you know that Laurie Berkner used to be a preschool music teacher? Well, she’s amazing, and I just learned that awesome fact from her newest album called Superhero. You can find this song as one of the bonus songs on that album! Get stomping around with this super fun song kid action song! The children will love it, and I do too! If you have Amazon Prime, you can stream it for free! My favorite way to stream is through our Echo Dot. If you have not heard A Root Chy Cha, it is so catchy! This is a song that will help children work on following directions and using their memory! Have everyone grab hands to form a circle for this delightful song by one of my favorite artists! This is a great one! Leave some room for flying and jumping around! This is also another one you can stream for free through an Echo Dot. This is the most requested children’s song that I have ever had in my preschool classes. Even though it’s a bit longer, it’s so engaging, so the children love it! Greg and Steve have some of our all-time favorite songs. We can’t get enough of the Kids In Motion and Kids in Action CDs! We also adore the book! This is another great kids dance song to work on following directions! My kids ask to do it over and over again. You’ll see why! This is the one I always did if I had my class standing in line but we had something happen so I needed a quick song that kept everyone in their spot. It’s great for circle time too! This is such a great one! I think this is best towards the end of the music and movement time. I had everyone sit down to it, and you may need to plan to do it more than once! This song is the perfect song to transition children from moving to quiet and listening. It’s great at meal times, circle times, transition times, and anything else you can think of! Mother goose club has a version of the open shut them song. Anything by Dr. Jean is fun too! Yes, we love Dr. Jean!